Join Us For the Next International Congress in Australia! Monday 28 September: Postgraduate Course Day – there are seven streams to choose from so follow your own stream, choose something different, or mix and match the sessions. Tuesday 29 September: The two Presidents of GESA & WGO will preside over unopposed sessions offering the best of current gastroenterology and our young investigators. Professor Michael Manns will give the traditional Australian plenary Bushell Lecture and Australia’s Nobel Laureate, Professor Barry Marshall, will deliver the WGO Distinguished Lecture. Wednesday 30 September to Friday 2 October: Learn about spectacular advances in the management of viral hepatitis or challenges funding the delivery of antiviral drugs to the global community. Evolution of therapies for IBD will be a must for delegates as new waves of biologicals challenge us to position them in clinical care. Endoscopy will feature several of the world’s experts presenting pre-prepared video demonstrations of “how I do it,” drilling quickly down into valuable tips and practices in endoscopy. The revolution in genetics will be integrated into the clinical program. Check out more program highlights here. All of this will happen in the beautiful sub-tropical city of Brisbane, which provides easy access for delegates to many of Australia’s world class and world heritage sites such as the Great Barrier Reef, Daintree Rainforest, deep sea fishing, and family friendly theme parks. Visit www.gastro2015.com for updates and complete information regarding the Congress. In 2016, WGO will partner with our colleagues in the United Arab Emirates, the Emirates Gastroenterology & Hepatology Society, to convene Gastro 2016: EGHS/WGO International Congress, 17-19 November in Abu Dhabi. And in 2017, WGO and the American College of Gastroenterology (ACG) will partner on the 2017 World Congress of Gastroenterology in association with The ACG Annual Scientific Meeting and Postgraduate Course, 13-18 October in Orlando, Florida, USA. After 2017, the World Congress will move to a two-yearly schedule beginning with the meeting in 2019. A Call for Bids for the year 2019 will be initiated soon. In addition, WGO welcomes indications of interest from our member societies to partner together to convene regional meetings. If you are interested in receiving additional information about collaborative opportunities around regional meetings and future World Congresses, please contact the WGO Secretariat at info@worldgastroenterology.org. May 29th and throughout 2015, events are taking place around the globe in celebration of WDHD 2015, Heartburn: A Global Perspective. See what is happening in your area of the world by viewing the events calendar. We also encourage all member societies to organize their own event to raise awareness on this year’s theme of Heartburn. Looking for information about heartburn? Check out the new Resources Page on the official WDHD 2015 website. It currently features information for both the general public and health care professionals. Tools, resources, and additional videos will be added throughout the year so continue to check back! To learn more about this year’s theme, view the official WDHD 2015 press release. Read an article from e-WGN issue #1 by Dr. Abdelmounem E. Abdo, Director of the Khartoum Training Center, on the center’s launch this January. Please watch the monthly e-Alert and future issues of e-WGN for more WGO Training Center news and updates! Have you watched WGO's webcast, “Irritable Bowel Syndrome (IBS): What is it, what causes it and can I do anything about it?” This educational program targets those common symptoms most associated with IBS. Begin viewing today! Are you receiving the quarterly e-WGN Newsletter? If not, sign up here! Have you reviewed the recent articles on “Migratory Movements and the Risk of Inflammatory Bowel Disease” and “The Impact of Racial and Ethnic Differences in Inflammatory Bowel Disease Phenotype in the United States”? If not, download the latest issue of e-WGN! Have you visited the Clinical Research Tools: Templates, Proposals, Methods and Statistics section on the WGO website? It features an Abstract Assistance Service that would be invaluable to those looking to submit abstracts to major meetings such as DDW and UEG Week. Click here to see if you are eligible for this service or to begin submitting your abstract today! Looking for clinical and research information? Take advantage of WGO's Ask a Librarian service. Looking for the latest literature in topics covered by WGO Guidelines? Begin accessing WGO's Graded Evidence System which helps to bridge the gap. The Virtual Room of Gastroenterology offers custom-made searches in PubMed to complement the WGO Guidelines. Visit now! In partnership with the Turkish Society of Gastroenterology (TSG), WGO is pleased to announce that the next TTT will be held in Antalya from 4-7 April 2016. The application process is now open and WGO invites its member societies to nominate up to two candidates by 18 September 2015! Preference will be given to member societies who have paid their WGO membership dues through 2015. For more information, click here! WGO hosted the 2015 TTT in partnership with the Gastroenterological Society of Taiwan (GEST) in Taipei from 13-16 April 2015. Watch for summaries of the successful event in futures issues of e-WGN. 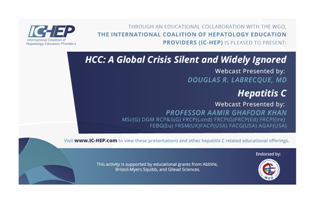 In collaboration with WGO, the International Coalition of Hepatology Education Providers (IC-HEP) created webcasts on HCC and Hepatitis C. Click the image below or visit www.IC-HEP.com to view these presentations. 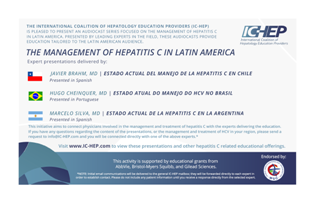 IC-HEP also created audiocasts on the management of Hepatitis C in Latin America. Listen to the audiocasts by clicking the image below or by visiting www.IC-HEP.com. T he WGO is pleased to announce that the Hepatitis C Guideline is now available in English, French, Mandarin, Portuguese, and Spanish on the WGO website! The Esophageal Varices Guideline translations have recently been updated in Spanish, Portuguese, and Mandarin on the WGO website. Additional translations coming soon! The Dysphagia Guideline was recently published in the JCG and is now available on the JCG website! Please contact the WGO Executive Secretariat if you are interested in publishing this, or other Global Guidelines, in your local journal. Watch future issues of the e-Alert for news on the release of more new and updated Guidelines! WGO Member Society Information and Update Forms for 2015 have been sent to all WGO Member Societies. Your expedient response ensures important WGO news and information will be received promptly by the appropriate contacts within your Member Society, and your cooperation is greatly appreciated! The 2015 General Assembly Meeting will be held during Gastro 2015: AGW/WGO in Brisbane, Australia. While the time and date of the meeting is in the process of being finalized, please be reminded that at the time of the General Assembly, only Member Societies who have fully paid their dues through 2015 may participate with full voting privileges. Membership dues invoices are created based on the information received on the Member Society Information and Update Forms; you will receive your 2015 invoice promptly upon receipt of the completed form. Visit our membership page for more information on the benefits of WGO membership. To inquire on the status of your society’s membership, or for any membership-related queries, please contact the WGO Executive Secretariat at membership@worldgastroenterology.org. The WGO Foundation is the philanthropic arm of the WGO. To learn more about the foundation, and how your support can help, please visit the WGO Foundation Website! The 36th Advances in Gastroenterology Course will take place July 8-10, 2015 in Santiago, Chile. The Paraguayan XII Congress of Gastroenterology and Digestive Endoscopy - Day of Diseases will take place July 22-24, 2015 in Asunción, Paraguay. GIHep 2015: Live Endoscopy Workshop will take place July 31, 2015 at National University Hospital, Singapore. For additional information, please contact secretariat@gastro.org.sg. The Gastroenterological Society of Singapore Annual Scientific Meeting will take place August 1-2, 2015 at the Mandarin Orchard Hotel, Singapore. For additional information, please contact secretariat@gastro.org.sg. A full list of scheduled meetings and their details can be found on the WGO Meetings & Events Calendar!